Below details of the Dutch troops. All coats were knee length with the waistcoat visible (i. e. the upside down V-shaped lapels), all except hussars and grenadiers wore bicornes with red-white tassels and short slack white plumes with black tips, cockades were orange. The grenadier bearskin looks very much like the Napeolonic Austrian one, but without a front plate and with a real bag, which hangs over the right edge (with the tassel approx. next to the ear) in the facing colour with white piping and (wavey) line through the middle. A similar hat (maybe a bit less tall) was worn by the lijfcompagnie of the Garde Dragonders (bag red and tassel and piping white). Some foreign regiments did have a front plate (Walen, Saksen-Gotha). Hair dress was as other armies: tail (possibly tucked away under the hat) with either horizontal curles or the vertical curl in front of the ear (pattes de chien). (Swiss Guards) and 1st, 2nd and 5th Swiss. WHITE: 1; regiment Walen and battalion Garde-Walen (Walloons). YELLOW: 7, 10, 13, 19, 21 and 23; 1st and 2nd regiment and 5th bat. Waldeck. CAVALRY The Lijfregement Oranje Friesland orginally consisted of 2 squadrons Oranje Friesland and 2 squadrons Oranje Karabinier, so after the re-organisation this regiment had 1 squadron left of both. Like the other regiments, the Gardes te Paard were also reduced to 2 squadrons. 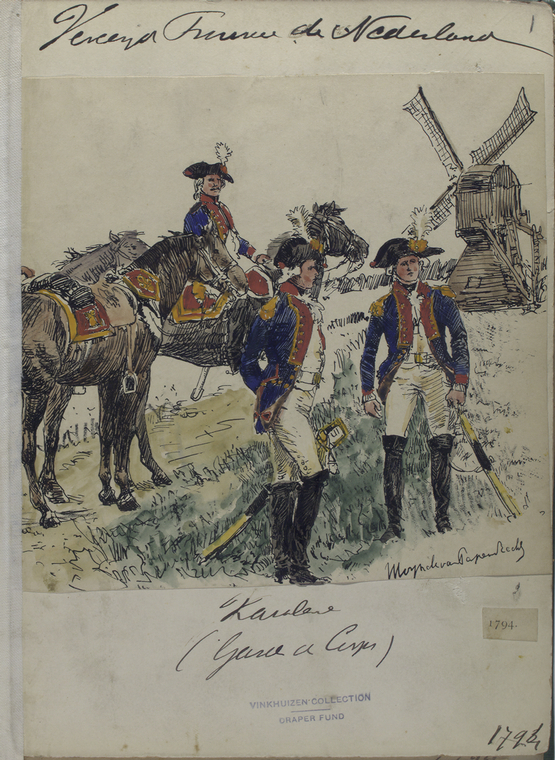 The Gardes te Paard had dark blue coats, others white; trousers, waistcoat, gloves and belts pale yellow. Cross-belts: the one over the left shoulder was much wider than the other. Shoulder straps same colour as coat. Buttons white metal. Boots were knee high. Regimental colours were: BLACK: Hessen-Philipstal (turnback red). DARK BLUE: Oranje Friesland (dark blue waistcoat; no lapels, but all edges of coat, including belts and bags, black-white chequered). GREEN: Van Tuyll (turnback red). LIGHT BLUE: Oranje Karabinier. PINK: Hoeufft (laced buttonholes and vertical lace bands on cuffs). RED: Bentinck; Van der Duijn; Gardes te Paard (with white piping on collar, cuffs and lapels). (except for the Hessen-Kassel dragoons, who had white trousers, waistcoat and belts). Cross-belts: the one over the left shoulder was much wider than the other. Shoulder straps same colour as coat. Buttons white metal. Boots were knee high. Regimental colours were: PINK: Hessen-Kassel. RED: Van Bijlandt (Walloons); Garde Dragonders (lapels not red but dark blue with white laced button holes, vertical lace bands on cuffs; separate lijfcompagnie had grenadier hats). HUSSARS These had the traditional hussar clothing (mirliton, pelisse, dolman, boots). The white plume was tall and had a black top. Officers wore a bicorne. Van Heeckeren: black pelisse with white fur, braiding and buttons, black dolman with light blue collar and cuffs, white braiding, piping and buttons. Light blue trousers with white piping. Mirliton black with blue flamme, white cords. Belts and gloves pale yellow. Timmerman: blue pelisse with black fur and yellow braiding and buttons. Red dolman with blue collar and cuffs and yellow braiding, piping and buttons. Red trousers with yellow piping. Mirliton black with red flamme, yellow cords. Belts and gloves pale yellow. ARTILLERY HORSE: dark blue coat with red collar, cuffs and turn backs. Lapels also dark blue, but with red piping. White epaulettes with red shoulder straps with white piping. Dark blue waistcoat with red piping. Trousers pale yellow. Buttons yellow metal. Knee high cavalry boots. FOOT: dark blue coat with red collar, cuffs and turn backs. Lapels also dark blue, but with red piping. Dark blue shoulder straps. Dark blue waistcoat with red piping. Trousers dark blue. Buttons yellow metal. Gaiters as infantry (summer white, winter black). OTHERS Infantry drummers and fifers: as unit, but with wings, cords and posibly horizontal lace bands on sleeves. Cavalry buglers and kettledrummers: as unit, but with wings and heavily laced false sleeves tucked in at the waist (Gardes te Paard had an extra red stripe running along it). Engineers: light blue coat with black facings (but red turnbacks), light blue waistcoat and trousers, buttons white metal, belts black, gaiters as infantry. Officers: orange sash; possibly white piping; buttons and cords etc. silver or gold (when their men had white or yellow resp. ); silver or gold tassels and epaulettes; no laced button holes except for the Gardes who had extensive silver lace and piping. Of course no cross belts or guns, but probably a fashionable walking stick to go with their sabre. Infantry officers would probably wear some kind of fashionable boot like the high, turned back type (so the brown leather inside becomes visible). High officers and generals in general: dark blue coats without lapels, closed at or just above the waist; cords, lace, epaulettes etc. gold; trousers, waistcoat white; knee high cavalry boots. 1) Foot artillery and pioneers etc. never wore the white gaiters in the field. SO for waraming puropes they always wear black gaiters. 2) Marine inf. regiments (yellow facings) had red musket belts and red collars. 3) The elite companies of the ordinary dragoon regiments may also have worn the bearskin, just as the Lijfcompagnie Garde Dragonders. 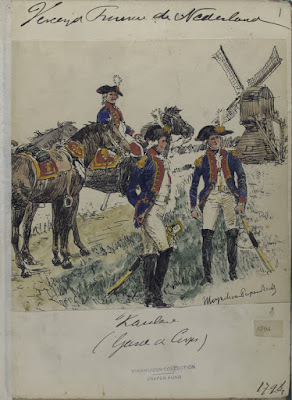 4) The company Gardes du Corpse (cavalry) had 2 uniforms: red coat with light blue facings, no lapels and gold laced buttons holes and for field service blue coat with red facings, no lapels, yellow piping, buttons and turn backs. However, they could never appear on the field with other cavalry. Toursers, gloves and belts pale yellow. 5) Cavalry regiments Bentinck and Oranje Friesland had yellow buttons instead of white. 6) Bentinck had white cuff flaps with red piping. 7) Epaulette in facing colour on right shoulder for part of: Van Thuyll, Bentinck, Van der Duijn, Hessen-Kassel (white epaulette) and (all of) Gardes Dragonders. 8) Some sources say cavalry plumes were all-white instead of white with black tip. Hussar troopers had an all-black plume. 9) Horse furniture: saddle brown leather, belts black leather with white metal buckles and diamond shaped white metal plate on chest belt. Pistol holsters and half-shabraque slantwise to the rear. Most had upside-down L in rear corner of the shabraque to form a small square with the edge band. Base colour + edges: Hessen-Philipstal: red + white. Oranje Friesland: light blue + yellow; small square is separated from shabraque edge. Van Tuyll: yellow + white. Oranje Karabinier: yellow + white. Hoeufft: yellow + white. Bentinck: red + green. Van der Duijn: red + yellow; the upside-down L's point is "pulled" upwards. Gardes te Paard: red + white-red-white band, no upside-down L. Hessen-Kassel: red + white. Van Bijlandt: red + white-red-white band, no upside-down L. Gardes Dragonders: red + white. Gardes du Corps: blue + yellow-blue-yellow band, no upside-down L.
10)Hussars: Part III described the Van Heeckeren uniform of 1794. But in 1793 it was: light blue pelisse with white fur, braiding and buttons, light blue dolman with orange collar and cuffs, white braiding, piping and buttons. Pale yellow trousers. Mirliton black with black, white (officer: gold) edged flamme, white cords. Belts and gloves pale yellow. For Timmerman some sources mention a slightly different uniform from the one in part III, the differences being: red pelisse with white fur, blue trousers, orange flamme. It's also possible that only the officers wore the pelisse. Both had the typical hussar shabraque with rounded front corner and long pointed rear corner, with a shark-toothed edge. The colours are for cloth - tooth edge - tooth - outer cloth edge: Timmerman red - white - blue - white; Van Heeckeren 1793 light blue - white - black - white; Van Heeckeren 1794 black - white - light blue - white. All had a black sabre-tache with thick yellow edge and yellow lion in the middle.